Pizza meet Cheeseburgers, Cheeseburgers meet Pizza. 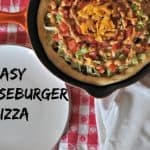 This recipe for Easy Cheeseburger Pizza will make everyone happy unless you’re a vegetarian, then it probably won’t make you very happy. Everyone else? Extremely happy! Is Pizza Night Really Pizza Night? What do you make when half the family wants cheeseburgers and the other half firmly believe that pizza night is PIZZA NIGHT. Period. End of story. I’m usually pretty lax about pizza night, whatever is in the fridge goes on pizza–pesto, peppers, ‘shrooms, bacon, sausage, pepperoni, ham, eggplant, really you name it, I’ll pop it on a pizza. Tonight when I dug around in the fridge I found a pound of hamburger I needed to use up and decided I’d make burgers for dinner. And OH NO that wasn’t happening, we have a dedicated crew of eaters around here but burgers on pizza night were fighting words. They still ate burgers just on a pizza. You know what? It was some of the best pizza I’ve made in a LONG time. A word about the tomato sauce base, if you want or prefer to use pizza sauce, by all means, please do, it’s your call. I made a rather plain sauce for my base because I wanted the topping sauce to shine through without an Italian flavor. Now it could be made sauceless, but toppings tend to slide right off if you don’t have some sauce on the bottom. As usual, this is an inspiration for you, take it, make it yours and go from there, there is no wrong way here. 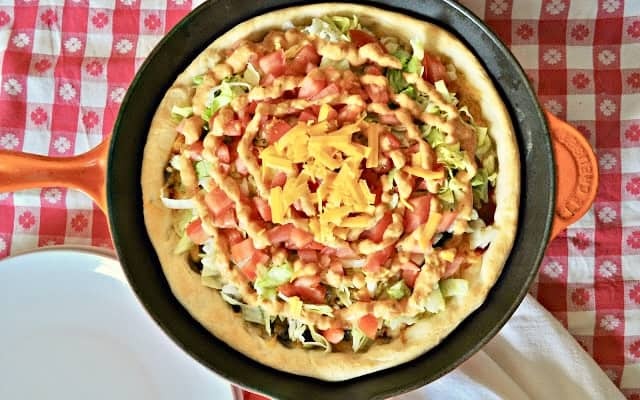 Need a change for Pizza Night?? 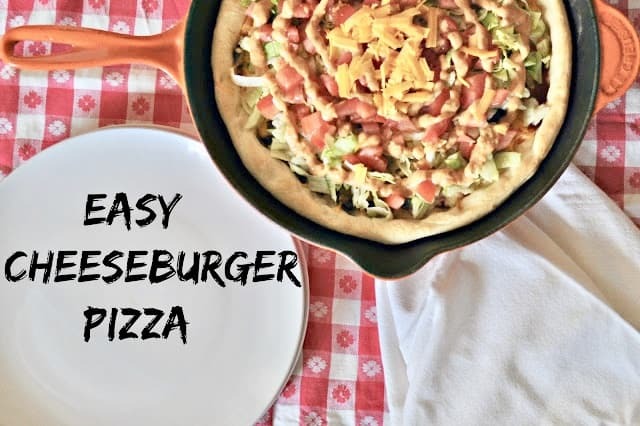 This recipe for Easy Cheeseburger Pizza will make everyone happy even the people who don't like cheeseburgers. Wait those exist?? I have never tried pizza in a cast iron pan but I definitely need to do it this fall when it starts to get cool again. I guess you could even do this with little personal cast iron pans for kids. Fun! Thanks for linking up with From the Archives Friday!